Congratulations to "Cris", the winner in Jennifer's giveaway. Thank you to all who participated. Thanks to Just Romantic Suspense for having me to the blog today! Since I’m a psychologist and author (or psycho author), I often get questions about how to write psychological disorders accurately. Romantic suspense authors love to put their characters through hell, sometimes resulting in the clinical syndrome of Post-Traumatic Stress Disorder (PTSD). Today I’ll share more about PTSD to help authors and readers understand this complex disorder. I've seen PTSD develop after individuals have experienced sexual abuse, motor vehicle accidents, childhood bullying, domestic violence, and suicide of a loved one, to name a few. What's interesting is that a group of people might all experience trauma but only selected few develop PTSD. Some factors that increase the likelihood of PTSD include a history of anxiety, past losses, and lack of coping resources. Abuse survivors are more likely to experience PTSD when that abuse occurred at a young age, was frequent and intense, and/or was perpetrated by someone close to them charged with their care. There are three groups of symptoms in PTSD: distress, numbness, and avoidance. Individuals typically alternate between states of high distress (reliving the traumatic event through flashbacks and nightmares, feeling on edge or "hypervigilant") and numbness (emotionally flat, exhausted). The distress taxes our systems so much that our bodies shut down and enter a state of numbness. The third symptom is avoidance of the trauma. For example, an individual who was sexually abused might avoid romantic relationships, because intimate situations remind her of the trauma. Or, a car accident survivor might not want to get into a car. One of the best movies I've seen about PTSD is Fearless. The movie features Jeff Bridges and explores the aftermath of a horrific plane crash. If you watch it, keep the tissues handy. Why do individuals with PTSD behave like they're in danger when they're not? A colleague explained it using a screen metaphor, which I thought was brilliant. Picture a screen in your brain. When a stressful event happens to you, chemicals like adrenaline flow through the screen and prepare you to handle the stress. However, when a trauma occurs, sometimes the chemicals scream through so fast that they bust a hole in the screen. Now individuals are left with a hole in their screen. The next time they experience something resembling a trauma (a "trigger"), the adrenaline rushes through the hole and they feel like they are re-living the trauma. Their heart races, they can't get air, they tremble, they freeze. Treatment can be very effective for PTSD. Since the brain is living in the past, one strategy is to bring the brain to the present through using grounding skills. Individuals should use their five senses to anchor themselves in the present: "I see the painting on the wall. I hear the clock ticking. I feel the surface of the sofa beneath me." Deep breathing is essential. When we are very anxious our breathing becomes shallow and fast, and deep breaths help quell the cascade of the stress response. Treatment also involves correcting dysfunctional beliefs that might have developed. The most common seems to be the belief "It was my fault" for abuse survivors. Because children are egocentric, they believe they alone are the cause of good and bad things that happen to them. As adults they need to learn that they are not to blame for the actions perpetrated by others. Therapy, specifically a technique called EMDR, might help individuals adopt a more functional belief like "I did the best I could." We all experience traumatic events, so this disorder can provide a realistic and dramatic backdrop to your characters. Good luck! People fascinate the psychologist/author (psycho author) known as Jennifer Lane. Her therapy clients talk to her all day long about their dreams and secrets, and her characters tell her their stories at night. Jen delights in peeling away the layers to scrutinize their psyches and emotions. But please rest assured, dear reader, she isn’t psychoanalyzing you right now. She’s already got too many voices in her head! Stories of redemption interest Jen the most, especially the healing power of love and empathy. She is the author of The Conduct Series—-romantic suspense for adult readers—-and is currently at work on the third and final installment: On Best Behavior. Streamline is her first foray into writing for young adults, but she’s found this sort of writing even more fun. A former college swimmer, Jen was able to put a lot of her own experiences into this book. Whether writing or reading, Jen loves stories that make her laugh and cry. In her spare time she enjoys exercising, attending book club, and hanging out with her sisters and their families in Chicago and Hilton Head. 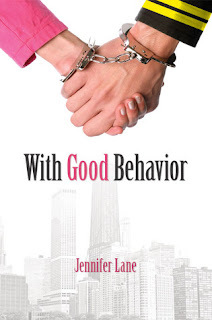 Jennifer is giving away an ebook of With Good Behavior (The Conduct Series #1) to a lucky winner (giveaway is international). To enter, leave a comment with your email address and answer the question What is your experience with PTSD? Giveaway ends 11:59pm EST July 9th. Please supply your email in the post. You may use spaces or full text for security. (ex. jsmith at gmail dot com) If you do not wish to supply your email, or have trouble posting, please email maureen@justromanticsuspense.com with a subject title of JRS GIVEAWAY to be entered in the current giveaway. That's a good explanation for how it occurs. Your day job must give you a lot of good ideas for characters, Jennifer! Thanks, Alex. Listening is so important for good writing, and I do listen all day long! You give a great run down on PTSD. I zoned in on impact for my Masters in Victimology. I too have had PTSD. I got it as a child with severe health issues. The one symptom that I find interesting is the 'startle response' in that it really is uncontrollable at the time it happens but it does give me a clue that I am feeling vulnerable then. I so very much want to read your series. Janet, I've met others who have suffered PTSD from chronic childhood illnesses like cancer or Crohn's. While it's not a pleasant feeling to jump out of your skin when startled, that's great you use that as a cue to treat yourself kindly. I've been lucky enough (so far!) to avoid any major trauma that could turn my anxiety issues into PTSD. CBT helps keep the anxiety under control when stressors pile up (being a science doctoral student terrified of public speaking, giving talks is at the top of that stressor list) and I have those "I'm not sure I can make it through this" moments. I don't have any experience with this. The book sounds interesting. and support of family and friends, he received the necessary counseling to deal with the PTSD. Thanks for a great post! I really appreciated the education about PTSD. I think that so many people have a misconception of PTSD b/c of it being so dramatized in movies and books. It's a great plot device but I think that it may be overused. I have an uncle who served in Vietnam and refuses to talk about his experiences. Sadly, he became an alcoholic to "medicate" his PTSD and we are watching him slowly kill himself. I have known some of the cops who have went and served in Vietnam and the Middle East. Coming back to civilian life is hard for them. They went through so much and yet people around them can't understand what they are going through. It takes a special person/friend to help them through this but the majority of them are still trying to deal with what they have seen and went through. PTSD is a scary illness, by just talking about it, we might feel we are already scared especially if we ourselves could experience it. Stress adds up the burden or because of pstd, an individual may become stressed and depressed. I know someone with this kind of situation, he is always scared though by just looking in the situation, all is normal, and during sleeping, he will awake because of bad dream. I hope the giveaway is still available.